CodeRed Cares... It's all about Caring! 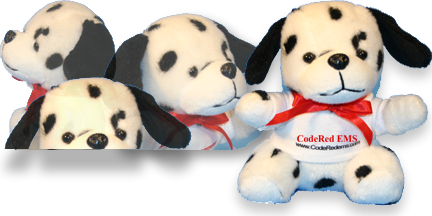 With that in mind, MacroLogic, Inc. has kicked-off CodeRed Cares as part of it's line of EMS projects. Providing the best ePCR software possible to assist in EMS Patient Care has always been the foundation of MacroLogic, Inc. and it's line of CodeRed products. As with most innovation, it comes by "thinking outside the box". We've never been in the box. That’s why CodeRed Cares. What if while continuing to provide the best EMS software we can, allowing Medics to focus on Patient Care, we could also do something for the Patient's directly... something to help take the "edge" off. We decided the next best thing to holding the Patient's hand, would be to give them something comforting like these soft little stuffed animals to hold on to. Copyright © 2012 Macro Logic, Inc.